This is a remarkable color changing bulb. 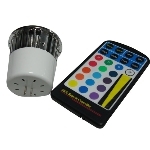 It can display 15 colors and white (MR16 Base). The latest generation of LED mitts use heavy black cotton/poly with white fingertips to hide dirt and makes hands almost invisible in the dark, allowing the focus to be totally on the brilliant LEDs! Upgraded light control unit for superior durability. 6 amazing light modes!